The Arisun Allure road tyre is great for mixed road and weather conditions. The smooth inverted tread is great for cornering and wet weather traction whilst giving optimal handling and stability for most road conditions. The tyre also has a central nylon puncture defence belt (ND) protecting you from most punctures. 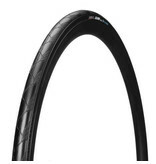 This 700x23/25/28 tyre is a great all rounder and comes with a wire bead and is therefore not foldable.